Hot sensible women. Even Marilyn Monroe took a run at the look and feel of it, wearing capri pants and a turtleneck, and holding one of her umpteenth husband Arthur Miller's books upside down while lounging on a couch. The fifties and pre-hippie sixties are always portrayed as stultifying for women in the current culture. I dunno. Blossom Dearie could really play and sing, and did, right until she died. She was plenty sophisticated. An urban fixture. Coquetteish and serious in turn. 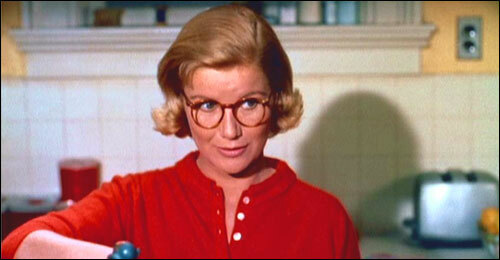 Midge was just a character in Vertigo, but movie characters reveal archetypes as well as any pop culture thing does. She was a bohemian in a garrett and had the audience murmuring to themselves that Jimmy Stewart oughta ignore the brassy broad and towers and settle down with Barbara Bel Geddes and her squirrel-hair brushes. Serious was a kind of fun then. There you go, guys. That's the Cliffs Notes to forty years of subscriptions to Cosmo. Make it so, and get your own Marilyn Monroe to read your book upside-down on your couch. I think the archetype for that may have been Lauren Bacall. Saw her once on a talk show. In the course of the conversation, "...put your lips together and blow." Came up. She did the entire scene, and I would have followed her to the ends of the earth thru hell itself. And she was in her early 70s. 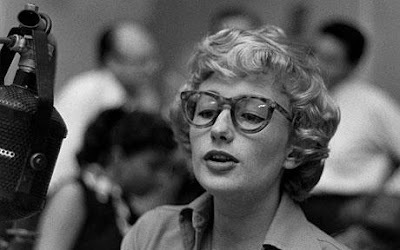 I don't shrink my music and listen to it with "buds," but if I did, Blossom Dearie would show every tenth song or so (along with Gene Harris). When I was a kid, I can remember my mom saying to my dad, "Why don't you peel me a grape?" And then they'd both laugh. One of the things I love about this lady is that she resists the urge(?) to simper while singing this song. The girlish voice is amazing. The face of an old lady aping a young dish while singing with that voice would have pushed it into nightmare. Thank you Blossom Dearie for what you did but also for what you didn't.